We'd really like to offer you 'just a regular rock crystal cluster', but we don't seem able to! 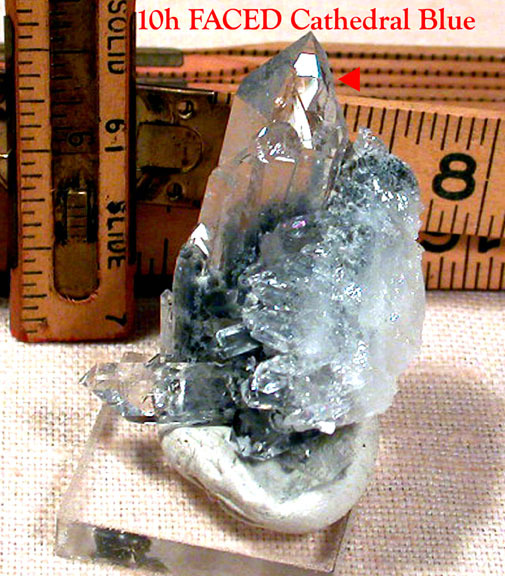 Ferocious blue phantom cluster from Arkansas boasts a TEN FACED crystal as the center of this cathedral [rare enough] cluster. Twins and rainbows group around. Phantoms are nice and sharp, there's one beauty mark of an inclusion [black manganese]. Big record keepers, no damage. 1 1/4x 1x 2", could be set to wear.